It all started a couple, three, four…it all started when I volunteered for the OGS Conference 2017 Social Media Team. I know some of you might be absolutely tired of me adding #OGSConf2017 to all my tweets and posts but I felt I needed to get the hastag out there in general. So, long before the thing actually started I was tweetin’ away (excuse me). Once things started rollin’ and attendees started registering, the social media team were in action. We posted and tweeted every event, standing at the back discreetly taking photo’s and sharing the presentations, workhops and events. From excursions on thursday through to Ancestry Day, we did our appointed tasks quite well! What a great team to work with. Thursday Night I tweeded a picture of Krsty Gray (@TheKirstyGray) having a pre-intereview interview with the CBC. Little did I know Kirsty was on the phone telling them they wanted to interview a local Genealogist, “Talk to Mags Gaulden”. Thank you very much Kirsty! I did the interview Friday morning and it aired Friday afternoon. 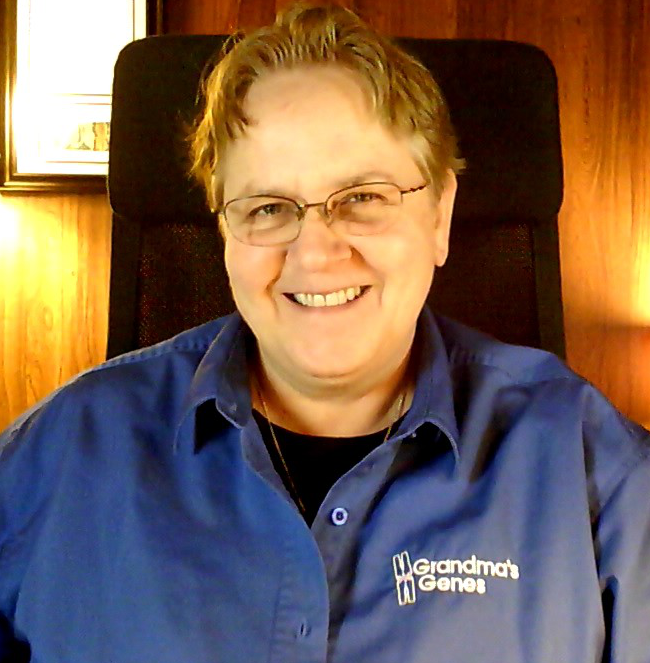 Over the weekend, because I was walking around with my Grandma’s Genes Kit on all weekend, I got stopped by more than a few people to say they heard the interview and had a question. Thanks Kirsty. I had recieved a request for a bid proposal for a project (can’t tell you what yet) earlier in the week, which I had been thinking over. Hadn’t even responded to them. On Tuesday this week – post conference – I got a call from the company asking for the bid. They had heard the interview and they really want me to get the bid notes together for them. Thanks Kirsty (curtsying or is it kirstsying). Someone asked if I was going to have a venders table for the Conference. “No, I am a walking billboard”. Basically my kit is a shirt with Grandma’s Genes Logo emblazened upon the pocket, my Bag with a Grandma’s Genes Bumper Sticker across the front, my business cards on a lanyard, a Grandma’s Genes Sticker on my Conference credentials and Grandma’s Genes on every bit of electronics I brought (this is for security as well). WikiTree didn’t have a Venders table either. They had a walking billboard as well. Moi. I bounced around the conference in Orange too. Saturday we did the WikiTree LiveCast Live From the conference. I had spread the word and posted a Casting Call for the LiveCast and boy did I get responses! Yes, real, live WikiTreer’s here in Ottawa answered the call. Thanks to Blaine Bettinger (my dinner date for Saturday night too), Kirsty Gray, Annette Cormier and Leanne Cooper for sitting in along with Romaine Honey, Librarian with the Ottawa Public Library and Emma McBeth for moderating from the West Coast. Thank you also to all the orange shirted people who randomly appear on camera through-out the LiveCast. 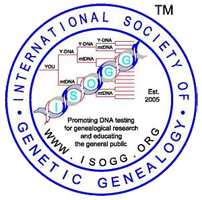 I also presented “DNA and the Global Family Tree” in a fast trax presentation on Sunday which Grandma’s Genes LiveCasted as well. At one point, I changed my shirt in the elevator (I should have have a telephone booth). Blaine said I should sew the two shirts together. He is awfully clever. There was a lot of that giong on as well. Living DNA and I discussed some of their recent changes which might facilitate some integration with WikiTree. Early days yet, so patience is the key here. Kirsty Gray and I decided to do a LiveCast about going to conferences, What to take? What to do? How to get into trouble? Stayed tuned for this one for sure! Blaine Bettinger and I discussed WikiTree’s DNA Project and genetic genealogy and family and food and his books being contraband at the border, what? What is in those books!?!? Just words and hard work! 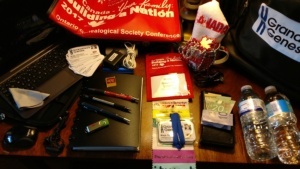 I got to Volunteer for the Program Committee for next years Ontario Genealogical Society Conference 2018. The real work of the Committee starts the same week I will be traveling to speak at a Family Reunion in North Carolina, he he. 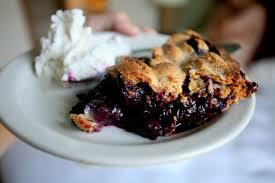 Why yes there was blueberry Pie. The Social Media Team plus a few extra’s spent Sunday Dinner together (when a group goes through something together they don’t want to be separated) and were treated to Blueberry pie of course courtesy of Grandma’s Genes. Thanks Bowman’s! Yes, I am sitting in the audience at the OGS Conference 2017 opening ceremonies blogging while they are reading the opening remarks prior to the opening lecture. My seatmates, the Social Media Team, are tweeting furiously and Kirsty Gray – sitting right next to me is watching the stream live on her laptop! Oh! The magic that is technology! None of us would be back here connected, posting, tweeting and generally being good social media team members if not for technology. This is a great conference already and some of us have been around since Wednesday night. These people had no idea we would stick like glue! But here we are. Last night’s event was the British pub night. Our team lost the trivia game by one point. ONE point, though we are not competitive. There are five Market Halls spread across the campus of Algonquin College and all are open to the public. You can roam around the conference, rub elbows with some of the big wigs, like Josh Taylor, Blaine Bettinger and Kirsty Gray, among others. Rubbing elbows with these people is easy here in Canada because, well it’s Canada, we are too polite to be “in thier space”. Many lectures and workshops are happening and some of the talks are being live-streamed. I’ve posted a list of the streams here, along with the unoffical WikiTree LiveCast I am doing on Saturday at 3:PM EDT here at the Conference Social Media Hub. Come up to watch and or join in! I had an interview today with CBC Radio 1’s “All In A Day” host Alan Neal all about Grandma’s Genes and my work with clients here in Ottawa and around the world. The interview was a lot of fun. So this is day one. We are at the opening ceremonies which will wrap up the festivities for this very busy day. Tomorrow is anothe day and great fun will be had by all. If you can’t be here, find a stream and watch it. See you at the LiveCast tomorrow.